This fee includes (lodging) sleeping and shower and bathroom accomodations in our recently renovated 100 year old comfortable log cabin. This hunt package also includes some of your transportation to and from active bait sites daily. This also includes personal daily placement on active baitsites inlcuding a ladder stand or ground blind with at least one or more bears hitting the bait. BearPaw will be serving an evening meal after each days hunt for your enjoyment. This is included in your overall guided hunt. Bearpaw will assist in retrieving, gutting , quartering,and preparing and freezing your meat and hides for your return trip home at no additional cost!!. ABSOLUTELY NO EXTRA FEES FOR TROPHY SIZE BEARS. NO HIDDEN CHARGES WHATSOEVER!! 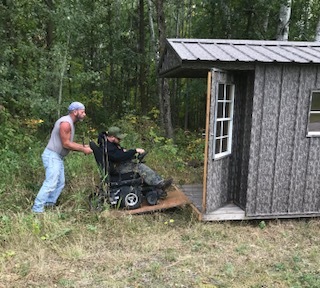 BearPaw Guiding does not charge any extra costs for handicapped hunters or physically limited hunters, senior citizens with mobility issues, cancer patients, or any other medical issues. WE will make this hunt for you! and we will get you to a stand on an active bait no matter what the issue is. BearPaw will accept personal checks, cashiers checks or money orders. We prefer just a simple check and at this time we can not accept credit cards.